Gary Johnson has another “Aleppo moment” and cannot name a single foreign leader. 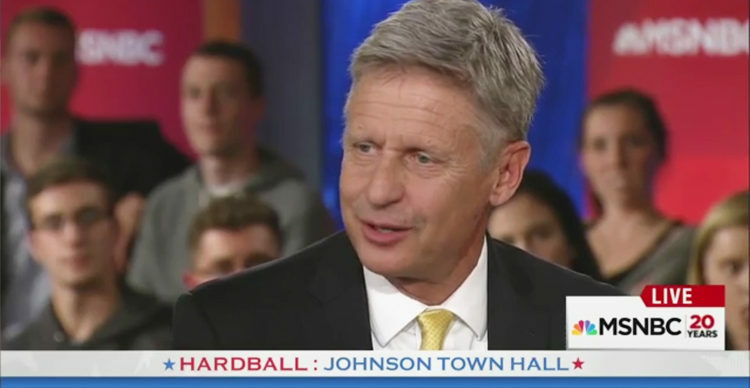 Libertarian presidential nominee Gary Johnson had difficulty naming a single foreign leader during a live episode of MSNBC’s “Hardball,” filmed at a town hall in the University of New Hampshire. “Who’s your favorite foreign leader,” MSNBC’s Chris Matthews asked Johnson. After a seemingly confused Johnson repeated the question, Matthews pressed him on the question. “Name one foreign leader that you respect and look up to,” Matthews said. “Anybody,” he added as Johnson searched for an answer. Bill Weld, Johnson’s running mate, tried to intervene offering that his favorite was “Shimon Peres,” the former Israeli leader who died this Wednesday from a stroke. “I’m talking about living,” Matthews shot back, pointing at Johnson. “I guess I’m having an Aleppo moment” Johnson finally said, referring to a blunder he made on “Morning Joe” three weeks ago when he asked “What is Aleppo?” after he was asked what he would do about the war-torn Syrian city. “The former president of Mexico,” Johnson answered. “I’m having a brain freeze,” Johnson. At this point Weld began to recite the names of recent presidents of Mexico. “Fox, thank you! He was terrific” Johnson replied when Weld finally got to Vicente Fox who served as president of Mexico from 1 December 2000, to 30 November 2006.